National Security (남영동 1985), based on the true story of the illegal imprisonment and torture of activist Kim Jong-tae (김종태), is a difficult and thought-provoking viewing experience. 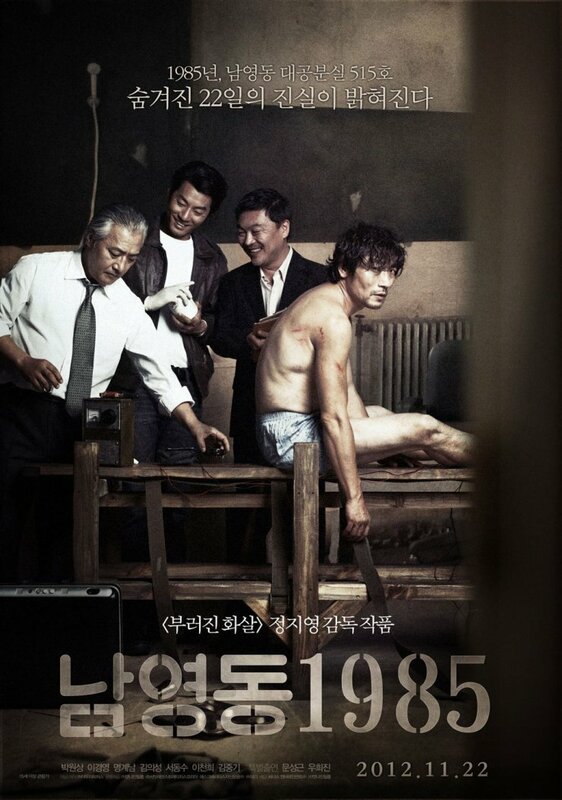 The second feature after director Chung Ji-young’s (정지영) 13 year hiatus from film making – after popular courtroom drama Unbowed (부러진 화살), also based on a true story – National Security is stark and uncompromising in portraying the abject humiliation and pain inflicted upon an innocent man. Such boldness was also reflected in the timing of the film. Turning heads and garnering strong reviews during the premiere at the 2012 Busan International Film Festival, National Security was distributed nationally at the end of November, coinciding with the run up to the presidential elections. While the film didn’t achieve the implied intention of halting conservative candidate – and dictator Park Chung-hee’s daughter – Park Geun-hye from winning the election, National Security is nonetheless a powerful film about the human rights abuses conducted at the notorious Namyeong-dong detention facility during the 1980s. While it occasionally suffers from repetition and lack of focus on the central protagonist, National Security is a highly compelling and captivating drama, and another great example of the politicization of contemporary mainstream Korean cinema. In September 1985, senior ranking democracy activist Kim Jong-tae (Park Won-sang (박원상) is abducted and taken to the infamous Namyeong-dong prison, where torture and false confessions are commonplace occurrences. 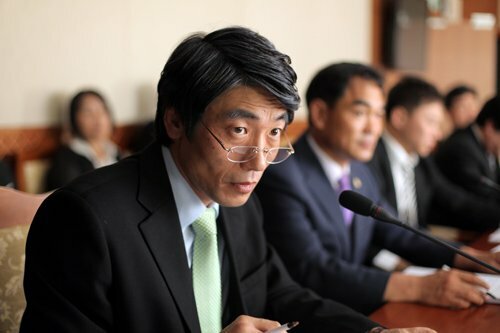 Through intimidation and bullying, the jailers force information from Jong-tae about his past with the Youth Federation for Democracy and his role in the movement against the military dictatorship of fascist Chun Do-hwan. When his answers aren’t what they want, the next 22 days are spent humiliating and abusing Jong-tae through beatings, water-boarding, and electricity, led by Lee Doo-han (Lee Kyeong-yeong, 이경영), also known as ‘The Undertaker’. Director Chung’s minimalist style is incredible in capturing Jong-tae’s predicament. The stark, washed-out tones coupled with the bare, dirty ‘interrogation’ room in which most of the film takes place, perfectly convey the hopelessness of the situation and the sheer lack of anything humane in Jong-tae’s environment. The director, who also co-wrote the script with three other writers, takes his time in building tension by slowly pacing the torture and humiliations that the central protagonist experiences making for compelling, and occasionally difficult to watch, scenes. Indeed, when Jong-tae first enters the detention room and is forced to strip naked and deprived of sleep and food, the tension is palpable and the emotional resonance disturbing. Yet as physical punishments are initiated and become more and more severe, the pressure is heightened and empathy deepened to the extreme. The torture techniques themselves, gathered from Kim Jong-tae’s memoirs and other prisoner accounts, are portrayed with frightening realism as water-boarding and electric shock methods are enacted, with the consequences quite horrifying. Yet while disturbing and powerful, such scenes of torture become quite repetitive over time as similar acts are enacted again and again, diluting their potency and causing the second act to stall for a period of time. The laissez-faire attitude towards torture by the guards is also one of the striking features of National Security. Director Chung does an admirable job in providing each of the jailers distinct personalities, conveying them not as evil but as men with few prospects. The relationships that build between Jong-tae and the guards are the source of ironic dark humour, as problems are shared and advice given before the humiliations begin once again. The most fascinating characterization is bestowed upon Lee Doo-han, also known as ‘The Undertaker’. Actor Lee Kyeong-yeong performs the role effectively, conveying the clinical precision and arrogant professionalism of the torture specialist. Whenever he appears on screen, the subtle charisma commands respect while his arrival signifies further pain for Jong-tae, making Doo-han a genuine love-to-hate antagonist. While great effort has been taken to provide characterization for Doo-han and the guards, oddly the same cannot be said for Jong-tae himself. In spending so much interest in secondary characters, director Chung appears to have forgotten about the most central one, an issue that also applied with his prior film Unbowed. Aside from a few fantasy sequences and a welcome although belated flashback, director Chung doesn’t really provide Jong-tae with enough history and information to create strong empathy with audiences, relying instead on audience awareness, and the shock of scenes of torture, to do so instead. Despite this, actor Park Won-sang is incredible in the role and performs with sincerity throughout, from moments of abject hunger and tiredness through to horrifying moments of torture. Yet the actor always manages to convey a sense of quiet dignity, even when his actions suggest otherwise. In a fascinating turnaround, National Security ends with Jong-tae’s career in politics in 2004, working within Korea’s fledgling democratic system to bring the events at Namyeong-dong to light and to halt such abuses from occurring again. Such scenes are powerful reminders of how recent such events were, and that many who were abused, as well as those who committed atrocities, are still alive. It is a fitting finale for such a poignant film, and serves well to instill a sense of modest victory amongst audiences, particularly those from Korea itself, although insinuates that there is still work to be done. National Security is a powerful, disturbing film about the human rights abuses suffered by democratic rights campaigner Kim Jong-tae at Namyeong-dong detention center in 1985. Director Chung Ji-young employs his minimalist style highly effectively in depicting scenes of humiliation and torture, allowing for the horror of the acts to speak for themselves. As the central protagonist actor Park Won-sang performs with incredible sincerity, while he characterization of the guards, and of ‘The Undertaker’ Lee Doo-han in particular, are developed, love-to-hate antagonists. National Security is a poignant reminder of the importance of human rights, and is a welcome addition in the politicization of contemporary Korean cinema.